I have been using LG Quantum with Windows Operating System. I would like to delete the browser history and also the Cache memory of my windows Mobile. Please provide me the steps to do it? Re: How to delete Browser History and Cache Memory in Windows Phone? 1)open internet explorer in windows phone now tap menu and tools and then options. 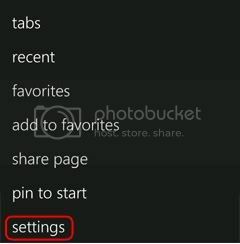 3)to clear cache and cookies tap delete files button and now your saved has been deleted. - Firstly open internet explorer into your phone..
- There you will see the memory tab .. just tap that tab ..
- To delete the cookies , tap on to security tab and then to clear cookies option..
Its done now and you have successfully deleted all the cache files , cookies , browsing history from your windows phone..
You can delete browser History and cache Memory in Windows Phone by manually or by installing any third party software. Go to the Application folder from the start menu. Go to Options under Tools. Go to the Memory tab. Tap on the Delete Files option to delete cache files & on the Clear History option to delete the browser history. Now restart the internet explorer to see the changes. You may download any third party tool to delete these files. Install the software & follow the steps given toclear browser History and cache Memory from your Windows Phone. FOLLOW THE STEPS AS IT IS TO CLEAR YOUR BROWSER HISTORY. >> Dear at first to clear browser history you have to open your internet explorer in your phone. >> Now choose tools from the option bar. >> Now there you will see memory tab click on it. >> Now here you have to choose the clear history option from the drop down list. >> Dear from here you can successfully delete your browser history or you can say cache files. delete browser History and cache Memory in Windows Phone by manually or by installing any third party software. => Now tap on option "Delete history"
It is possible you can delete history in windows phone. ->open internet in windows phone. ->here you have to select which data you want to delete. ->click on the delete option ...that's it. ** click delete button or you delete all data by clicking delete all history button. Here i can see that you want to know that how to delete browser history cache memory in windows phone..So i will tell some easy steps to that how to delete the browser history cache memory from windows phone ..First you just see all steps then try it yourself..
First of all go to the your windows home screen and then go to and open the internet in your windows phone after that select the menu and then now here you select history option.And at the end you have to select that which data you want to delete..Now just click on the delete option.